It pains me to say this as a Boston Celtics fan, but they should sign Carmelo Anthony once he becomes available. I think he has just enough left in the tank to help the Celtics offensively and could help players like Jaylen Brown and Gordan Hayward. ESPN’s Adrian Wojnarowski reported a few days ago that the Houston Rockets will part ways with Anthony, but the Rockets have not made clear how or when they will do so. The Rockets cannot trade Anthony until after the Dec. 15 trade restriction because Anthony signed with the Rockets this past summer. The 34-year-old veteran has been linked with many teams including the Celtics due to Kyrie Irving’s postgame comment calling for the Celtics to sign a “15-year veteran”. It’s most likely that Irving is referring to Anthony in this comment which I completely disregarded as silly. However, I thought about the deficiencies that the Celtics have through the early part of the National Basketball Association (NBA), and I realized that there is a case for Anthony on the Celtics. The Celtics are ranked near the bottom in offensive efficiency but lead the league in defensive efficiency. Players like Brown and Hayward are struggling so far but could easily turn it around by January. Something that could ease the pressure off Irving, Jayson Tatum and Al Horford, players who are leading the Celtics offense, is signing Anthony. Anthony is a bad defender. The Rockets have tried to hide him on defense by having him guard the other team’s worse offensive player, but NBA teams are too smart now. Teams are able to exploit Anthony off switches and pick and rolls, and they are able to get easy buckets off of him. This was the case as well when Anthony was on the Oklahoma City Thunder. Like the Rockets, the idea of signing Anthony seemed like a terrific idea. Also like the Rockets, the Thunder soon realized that their expectations were not met. 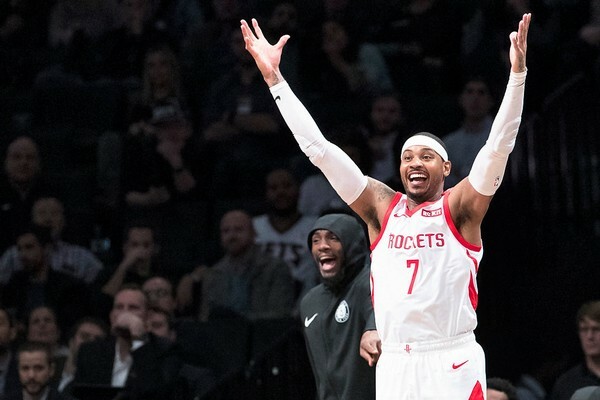 However, what has been consistent through Anthony’s time with the Thunder and the Rockets is that Anthony can still be a contributor on the offensive side of the floor. He is an efficient post-up scorer and is able to thrive in the pick-and-pop game. The problem is that Anthony does not seem to have any interest in being a role player. Every time we see Anthony score from a spot-up three, there are times where we also see him take too many dribbles for a long two-point shot. This could be a problem for the Celtics who have a clear hierarchy with Irving at the top and Hayward, Tatum and Horford behind him. Interesting enough, Tatum is the ideal version of Anthony. Their games are similar, but Tatum has adapted well in the modern game. If Anthony can do the same, I would be curious to see how head coach Brad Stevens tinkers around with the multitude of versatile players. Anthony’s offensive skill set could help give a boost to the Celtics offense, and Boston has enough average and above-average defenders to hide Anthony better than the Rockets and Thunder could. There is a scenario where Anthony could be a key contributor for a Boston team with high ambitions, but this is predicated on the idea of Anthony accepting the responsibility as a role player. If he cannot do that, then he should take Tracy McGrady’s advice and just retire.